, when I look around and notice that everyone sitting around me is either facing away from me or deeply distracted by their phones. I watched three people come into the cafe and, out of about 10 seats, chose the ones facing away from the centre of the cafe, and away from me. I see a man swiping vigorously on his phone, probably on tinder. I see a girl who looks quite bored, scrolling through her phone and I wonder if she's scrolling aimlessly on Instagram at lives that look so much better than hers, because I'm guilty of the exact same thing sometimes. I see another girl who looks like she's writing an article or blogging on her laptop, but again chose to face away towards the wall. I'm sat at a large round table with eight seats, facing the centre of the cafe, yet all of the other seats are empty. I began to wonder why no one else wanted the company of working together, or being near another person who they could possibly start up a conversation with. I understand that sometimes people just want their personal space, but I realised that anytime I'm in a cafe, the exact same thing happens. Everyone sits as far away from each other in their own corners. 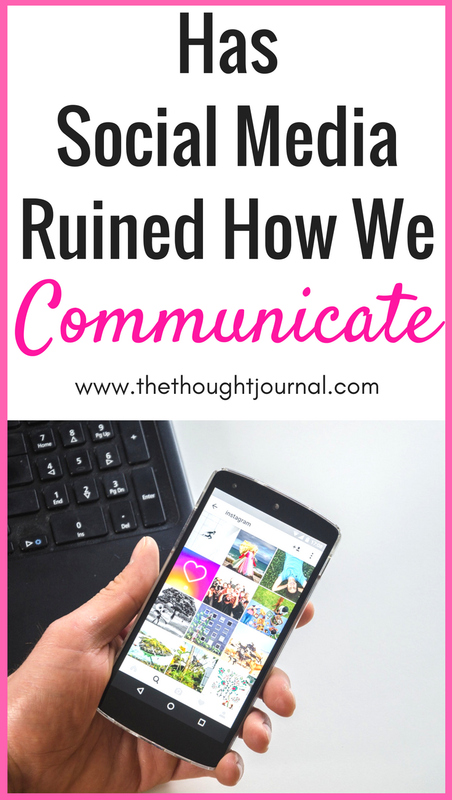 Has social media taken over communication? The only people speaking to each other in this cafe are groups of teenage girls, just out of school and having a good time. Is social media to blame for less communication and less human interaction? I'd love nothing more than to take a break from working and talk to someone else in this cafe, but I don't want to disturb the guy scrolling through Facebook, or the girl who's deeply concentrated on her phone. Has it always been like this? When did we all become so concerned with social media and the internet that we stopped communicating with each other? Of course, social media is a great tool for business or even keeping up with friends, but I feel like social media has replaced a huge part of human interaction and I'm also guilty of avoiding talking to strangers by scrolling through pointless things on social media on my phone. A relationship I recently came out of was predominantly over social media. We eventually only communicated over snapchat and rarely had actual conversations. I actually think social media was one of the main reasons that relationship failed. I don't want to be in a relationship with someone who the only way we communicate is by sending 10 second long pictures with a few words attached. Social media doesn't often allow for meaningful conversations or to make proper relationships. Social media is a good tool for keeping in touch with friends or people we wouldn't otherwise be able to speak to because of distance, but I feel like social media is taking over our lives and our relationships with people. Any relationship I have in the future I'm going to make sure I limit the use of social media and only have actual phone conversations if I can't speak to them in person. Social media can make us so concerned with everyone else's lives that we forget to focus on our own. I wish we could make more connections in real life, rather than connections over social media. I am also into the business world, and I am a newbie to the internet marketing of my brand. Have been doing a lot of research nowadays in order to connect with a large set of audience for the sales growth. I found that Twitter and facebook ads services are quite beneficial. Can you share an in-depth post on using both these platforms for paid marketing?